The botanical name for is Ageratina. It is a genus of perennial shrubs. They grow mostly in the warmer regions of the Americas and the West Indies, particularly Central America. In Mexico there are more than 150 species. Two of the Mexican species have become a problem in some parts of Australia and Taiwan. Ageratina once belonged to the Eupatorium genus but was reclassified. The roots of Ageratina altissima were used in the past to make tea and a poultice was also made from the roots. 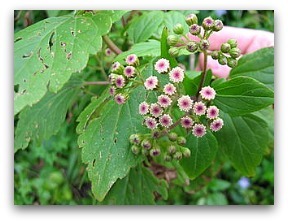 Native Americans made a poultice from Ageratina altissima and used it for snake bites. According to the Native American Ethanobotany written by Daniel E.Moerman, it was used in herbal sweat baths. They would also chew the root and hold it in the mouth to treat toothache. They made an infusion or decoction from the roots for inflamed or fallen womb. See more Native American herbal remedies. Ageratina picinchenisis is used as a traditional mexican remedy for fungal infections. Researchers from Mexico conducted a clinical trial which compared two concentrations of Ageratina pichinchensis extract on patients with moderate and mild nail fungus. The concentrations were 12.6 and 16.8%. The treatments were given to the patients for six months. 67.2 % found that 12.6% concentration was effective in curing their nail fungus, 79%.1 found that the 16.8 extract was effective. Ageratina altissima has a toxin called tremetol, cattle become contaminated when they eat this, thus the milk and meat also becomes contaminated, if the contaminated milk and meat is consumed in large amounts by humans it can cause tremetol poisoning which in turn can cause death.